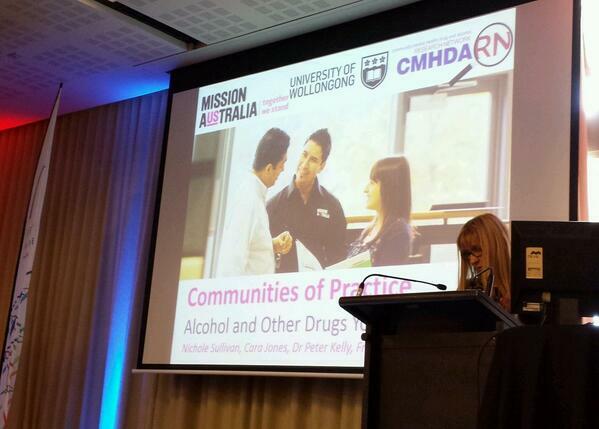 SF S9: Communities of Practice: strong teams, competent leaders and skilled clinicians - TheMHS Learning Network Inc.
Nichole Sullivan spoke with us about a workforce development strategy used within the youth drug and alcohol sector: Communities of Practice. With the transfer of traditionally government-funded services to private and NGO sectors, and the growing acknowledgement of the important role of persons with lived experience of mental health concerns, Nichole suggests that Communities of Practice are a valuable model for improving services and sharing expertise. Derived from the educational theories of Lave and Wenger, the term “Communities of Practice” refers to a group of people with a shared professional concern or interest. Such groups can form organically thanks to common knowledge, interests, or social engagements, or may be implemented from a top-down perspective within an organisation for a particular goal of gaining and sharing knowledge. Such groups allow for knowledge to be passed from novice to expert, and between peers. Members of communities of practice have the opportunity to develop both personally and professionally, while working towards solving problems facing the group. Nichole cited a corporate example of this model in place in the car company Chrysler. The company implemented a major system reform, and created teams working on each type of model to improve efficiency of production, but it gave rise to another set of problems: innovations didn’t spread, tasks were duplicated, and same mistakes being made by different teams. Frustrated by the isolation of working in product-focused teams, informal “water cooler discussions” and social get-togethers offered a chance for ideas to be shared among engineers. Providing sanctioned time for these engineers to work together allowed the team to develop a passion for innovation, and a formal process of knowledge that could not be gleaned from a textbook. They started working together to construct an e-book to share expertise and knowledge. Chrysler’s production cycle improved, as did their business as a result. Across the health workforce, a similar model of Communities of Practice is being adopted to facilitate such improve outcomes and shared knowledge. 3) Repertoire: What skills and knowledge are being shared. Communities of practice may exist across organisations, vary in composition (single or multidisciplinary), and be face-to-face or virtual. Research and evaluation has demonstrated their benefits in the health sector, but no prior research has examined the role of Communties of Practice in drug and alcohol services. In 2012, Mission Australia released an internal document across the entire spectrum of their services. Policy and procedure development meetings followed, and the committee focused on making their services locally responsive. Representatives from different specialities and geographical locations with Mission Australia met via teleconferencing to discuss issues specific to the establishment of two new regional youth drug and alcohol centres. Towards the end of their discussions, however, one representative raised a question as a simple aside – what is to be done about the issue of clients absconding without notice? From this question followed an open and honest dialogue between peers, and from this peer-to-peer group evolved a more formal Community of Practice across the organisation. The core membership of the Community of Practice comprises roughly twenty-five members across five states. Their professional specialities comprise psychology, social work, mental health nursing, general practice, and youth services. The shared domain is across all Mission Australia residential youth alcohol and other drug services, with a client group between ages 13-24. These services work with families and communities as well. 85% have mental health issues and in some services, a large proportion of clients are of Aboriginal and Torres Strait Islander background. This domain is narrow enough to allow a common focus, yet allow each of the services operate in different capacities to share knowledge and expertise. The community meets formally face to face quarterly, as well as using email groups, teleconferencing and web-share points points to continue dialogue among members throughout the year. The skills repertoire of the community spans counselling, vocational training and education, living skills, medical care and care coordination. It is a multimodel group, incorporating motivational interviewing, CBT, ACT, DBT, mindfulness, vocation/education/training, health and fitness, and smoking cessation. Notably, the group has developed and shared clinical guidelines and resource libraries. Currently, the group is developing a testing library to share testing resources. In meetings members are able to share policies and procedures, share accreditation evidence, share resources and data/research outcomes. The open peer-to-peer interaction in the Community of Practice allows for complex case review, discussion of ethical dilemmas, social elements of bringing people together from students through to experienced clinicians and managers, and benchmarking (drawing from each others’ experience and raising the bar across the board). 100% reported they had a good understanding of purpose of the group, and that the Community of Practice provided a confidential, respectful and robust forum for healthy debate. 76% agreed or strongly agrees that members could share opinions without fear of judgement. 100% agree the Community of Practice recognizes the unique aspects of each site across the different geographical locations. 94% agreed it assisted in identification of common problems and issues. 82% agreed it allowed for development of culturally appropriate and safe practices. However, barriers and challenges existed in each site in the program, including distance, budget and workload. Recommended improvements to the Community of Practice were more structure, more professional development, less email, reducing attendance barriers, and a broader membership. Nichole reported that members have been highly satisfied with the Community of Practice program, which is consistent with the organisation’s philosophy. Through this, Mission Australia’s youth drug and alcohol services have been able to codify and define a model of peer-to-peer knowledge sharing which has implications for a broad range of mental health services.